I wondered how and why this lit mag came to be, so I asked editor Jennifer E. Hudgens a few questions to find out. See my interview with Hudgens and submission guidelines below. HOPKINSON: Tell me a little bit about Wicked Banshee Press. HUDGENS: Wicked Banshee Press is in a rebuild of sorts right now. I’ve taken over as Editor in Chief and I’m building up our new website and trying to get our previous issues archived on it as well. We’ve always accepted submissions for women and those who identify as non-binary/non-gender conforming. We’ve changed this up a bit for one of our submissions calls Silence is NOT an Option. Primarily, we want amazing. We want your raw, beautiful, and guttural work. We want to publish stuff by those who make up a very small percentage of the modern lit/publication world. Women, especially women of color, trans women, etc. are published at such a lower number than men. I think it’s important that there are more spaces to lift these writers/artists up and show their talent to the world. HUDGENS: It was SaraEve’s idea initially, and I gladly hopped on board because I believed in what she wanted to accomplish with it. 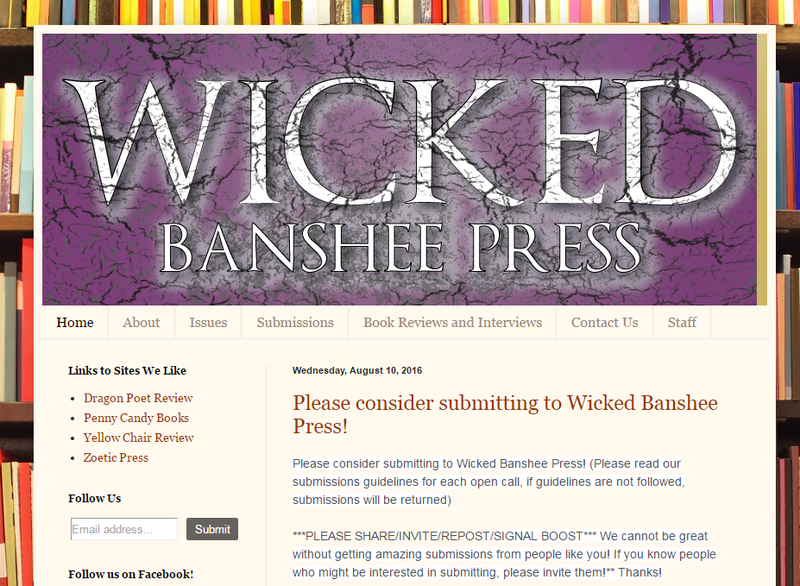 She asked me what I thought we should name it, and Wicked Banshee Press kind of just bubbled out. We got tired of hearing that so many women felt left out of the publishing world. As a poet, you hear a lot of journals that post the “cool kids” those poets that are highly regarded in the slam community to gain readership. I’m not saying that these writers aren’t valid or talented. I just think a lot of mags tend to avoid publishing unknown writers because it’s not the popular thing to do. Everybody deserves the opportunity to submit and have their work viewed equally, regardless of their standing in the slam or lit community, their ages, or backgrounds. We wanted to find a way to shine a light on pure talent of these artists. HUDGENS: Words Dance Press, Hyacinth Girl Press, Drunk in a Midnight Choir, Zoetic Press, Yellow Chair Review, just to name a few. I love lots of journals. The list is pretty gigantic. These are just a few I can recall at the moment. I highly recommend you and everyone else follow these journals. They are putting out some amazing work. HOPKINSON: I see that right now you are running a special issue entitled “Silence is NOT an Option.” Can you tell me more about it? HUDGENS: In the aftermath, (I hate having to say this) of the shooting in Orlando, killing 49 LGBTQA POC, my staff and I thought it was important to open up submissions for anyone who identified as LGBTQA+ (I honestly get lost on all of the additions to it). As someone who has only in the last few years come out as queer, this hit home. This is something that could’ve happened at any number of the clubs myself and friends used to frequent in OKC. In 2016, there are still no truly safe spaces, and that is hugely tragic. HUDGENS: WBP is looking for those pieces that hurt. The poems and prose pieces are raw and honest. The stuff that is difficult to write, and sometimes difficult to read. I think readers need to feel uncomfortable, because life is uncomfortable sometimes. We also want the stuff that evokes joy and celebration, the celebration of being alive, human, and of surviving in this crazy world. So many of us are battling something. Ultimately, WBP, I hope, is a sounding board and a place where people can understand that they’re not alone. HUDGENS: The best place to send a question is via email, if they want to ask us about anything relating to the mag, they will need to mark the subject line: questions/inquiries and send it to wickedbansheepress@gmail.com. We usually get back with folks within a day or so.